Sharp revealed its first 3D camera for mobile devices this Wednesday, detailing that they plan to start production of the module before the end of the year. The camera module, which marks an industry first, is being positioned specifically for smaller devices, such as digital cameras, cell phones and smartphones. Sharp says that the camera would hopefully inspire the development of new and innovative tools for communicating--3D video calls anyone? 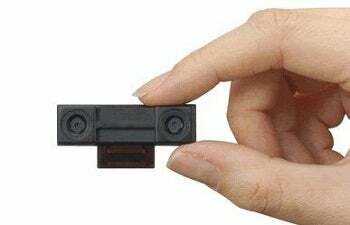 The module is said to be capable of capturing 3D footage at 720p resolution, but Sharp offers few other details. Sharp did however say that sampling of the new module would be available in July before mass-production commences later in the year. Sharp made no mention of the camera's cost, however Current Analysis researcher Avi Greengart has predicted that the modules cost should not "dramatically change the cost of phones" due to subsidization practices. So 3D video on the move could well be a mass-market reality if his prediction stands true. Beyond Sharp's 3D camera, the company has also revealed other mobile intentions. Last month the Japanese electronics firm outlined plans to bring glasses-less 3D viewing technology to mobile screens, a technology, which according to rumor, could be used in Nintendo's next iteration of their popular DS handheld. Apparently this mobile 3D experience will be delivered via an LCD panel - Yet despite it offering up a much desired glasses-free 3D view, it reportedly is a technology very much in it's infancy, displaying issues with viewing angles and problems depending on how the screen is positioned by the user. What are your thoughts on the future of 3D? Would you like to make video calls in 3D from your smartphone? Let us know in the comments!